Konami will be releasing the first data pack for Pro Evolution Soccer 2013 this Thursday, the day of the game's release in Europe. The update will add the stadiums of the three newly-promoted La Liga sides; Real Valladolid, Deportivo La Coruña and Celta Vigo. Thirty-seven sides - including Olympique de Marseille, Ajax, FC Porto, Beskitas, São Paulo and Corinthians - will also undergo kit updates. The PES Team have also confirmed that a second data pack will arrive next month. This update will - amongst other things - incorporate the completed deals from this summer's transfer window and will arrive in mid-October. Konami Digital Entertainment GmbH has revealed the content of the first free update and DLC elements for its stunning PES 2013 title. As with previous iterations of the series, KONAMI is committed to constantly adding to PES 2013, and KONAMI will release the first DLC pack to coincide with the game’s release for PlayStation®3, Xbox 360® and Windows PC. This first DLC adds the three licensed stadia of the newly-promoted Spanish clubs, and updates the latest kits for 37 licensed clubs, including Marseille, AJAX, FC Porto, Besiktas, and Corinthians. A second DLC pack will follow in mid-October, reflecting all summer moves and adding further stadia, UEFA elements, team updates, and online element updates. Detailed information will be released shortly. The first update will be available in October and ramps up the online side of the game. It adds a Widget system that acts as a shortcut to gathering friends together for online matches and introduces a Ranking system. 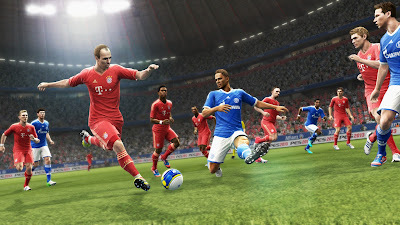 PES 2013 allows up to eight people to play in a match simultaneously, and the new download adds Community modes, wherein friends can be automatically selected from a pre-determined list, and allows Communities to track and monitor their results. The free update unlocks the Incentives element of the myPES Facebook app, wherein achievements are rewarded and can be shown via the Social Networking service. Users can also now concede a match at half-time, while Master League Online fans will be paired against similarly-rated peers in a new Rival Ranking system.